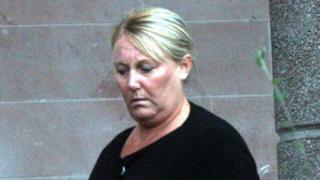 An office manager paid herself £30,000 of unauthorised overtime over more than six years, a court has been told. Wendy Shaw, 46, boosted her earnings by falsifying spreadsheets at Stirling-based fire and flood firm Total Reinstatement Services. She was suspended and escorted from the premises when the fraud was discovered in 2014. Shaw admitted defrauding the company between March 2008 and October 2014 and will be sentenced on 14 November. Falkirk Sheriff Court heard that Shaw told the firm's accountants to email all payroll returns directly to her and ordered them to stop sending paper copies to the company's managing director Brian Gillies. The court heard that Mr Gillies requested a breakdown from the accountants of staff earnings from the previous 12 months as he was planning on issuing bonuses. Prosecutor Samantha Brown said: "On examination, he observed that the accused had been getting overpaid." Miss Brown said Shaw was called to a meeting, suspended, and escorted from the premises. Letters from the accountant addressed to Mr Gillies, but never received by him, were found in Shaw's desk drawer. Shaw, of Cowie, Stirlingshire, apologised and discussed the prospect of repayment, but the police were called when when no money was forthcoming. Sheriff John Mundy told first-time offender Shaw: "It is a very serious matter given the amount involved, and in the light of that, the court has all options open to it, including a custodial sentence."